Are you in control of the voice in your head? Do you often find yourself submitting to the negative narrative running on an endless loop in your mind? Everyone has had to deal with what I call the “Negative Coach” from time to time. It can pop up at any time, and it has opinions about every aspect of your life, regardless of whether you’re dealing with present, past, or future events. Not only does it comment on what’s happening, but it also makes predictions and stores painful memories to drudge up at inconvenient times—and we always listen to its assertions and allow them to affect our decisions in unhealthy ways. If so, then stick around! Today, we’re going to be discussing a key step to taking control of this inner voice and positively influencing your mental and emotional wellbeing for good. You can be the most confident person in the world and still be emotionally decimated by one day of bad self-talk. Negative coaches are extremely powerful, and they affect everyone. The big difference between an exceptionally confident person and a socially anxious person isn’t that they were born without a negative coach—it’s that they’ve learned to move past it. Fact: even the most successful business people, performers, and athletes feel nervous before a big day. Past successes and clear, powerful visions for our future can’t help us achieve what we want in the present if they’re being drowned out by fear and despondence. When we allow the negative voice to take control, it propels us into a downward spiral of gloom. We almost always believe the terrible thoughts over the good, and even when we can get past that negative mental state and take action, the voice takes over again and tells us that the action wasn’t good enough. YOU CAN’T WIN THIS WAY. So, how do we begin to move toward a mental state in which we can take control of those emotions, quiet our negative coach, and regain control over our futures? 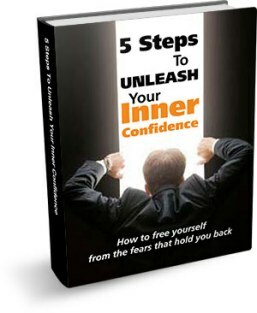 Well, firstly, I’d recommend going to my website, SocialConfidenceCenter.com, to pick up a copy of my FREE eBook, “5 Steps to Unleash Your Inner Confidence.” This book focuses strongly on daily practices you can use to take control of the voice in your head and impact major change in your life. In the meantime, though, I’d like to share one tip with you that will start you down the road to success and allow you to build on that success later! So, what’s this powerful tool? Self-respect. Take a moment and think about how you talk to yourself on a daily basis. Do you use kind, respectful language; or do you berate yourself and assert unreasonable expectations with cruelness and judgement? When we use negative feedback on ourselves as a means to inspire change, we just make ourselves more unhappy. Not only does this method NOT fix the problem; in many cases, it causes us to hyper-focus on it, making it ten times worse. I did this to myself for years. Throughout high school and college, I saw flaws in my face and skin, and I thought to myself, “If only my acne would clear up, everything would be great!” As an adult, I had let go of those issues only to replace them with hypercriticisms about my body, always assuming that my life would be wonderful if only I could perfect the flaws I perceived. My negative inner critic would see these aspects of my physical self and go on a full-on rampage, cutting into me and decimating my psyche. Eventually, I realized that I was not practicing what I preached. I made a pledge right then and there to take charge of my own happiness and mental wellbeing by deciding only to treat myself with dignity and speak to myself only with respect. Think about it this way: would you EVER talk to a good friend the way your inner critic talks to you? For the most part, I’m guessing not. If you would never rip into a friend for his or her flaws, then why do you do it to yourself? Shouldn’t we at least show ourselves as much respect and kindness as we show our loved ones? You are a valuable human being who deserves to walk through life without being afraid of the bully in your own mind. You are not undatable; you are not unlovable; you are worthy of friendship and kindness. So, whenever you feel that negative coach taking over, stop what you are doing and change that pattern! Whoa, whoa, whoa. I don’t do that. I don’t talk to myself that way. I only treat myself with respect, and I talk to myself with dignity—I talk to myself like I would talk to someone I love. Then, take a moment to build yourself up, rather than tear yourself down. Find something positive to say about yourself, and really mean it. Find a mirror if that helps, look into it, and talk to yourself with support, like you’d talk to a friend in need. In order to build your confidence and create the life you want, you absolutely MUST get on your own side. No one else can do that for you—it’s something only you can do for yourself, and it takes hard work, practice, dedication, and faith. I get it—sometimes this work can feel a bit cheesy . . . but it works! 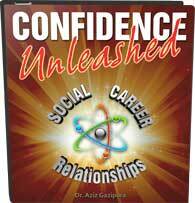 Confidence isn’t something we’re just innately born with—it’s something that can be (and has to be) learned. And the only way to “learn” it is to unlearn all of the negative patterns we’ve created throughout our lives. That is all we’re doing—retraining our bad mental habits. Sure, this may sound simple . . . but it’s much more difficult in practice than it is in theory, and that is what I’m trying to help you work through. I’m not going to lie to you: it’s tough to go out into the world and step outside your comfort zone. That’s why it is so essential that we get comfortable with it in our own space (and accept the good that can come from the work) before we take it out in front of other people. If you take two people with all of the same characteristics—same looks, same body, same circle of friends—and the only thing that sets them apart is the way they talk to themselves, I can guarantee you that the person who is practicing the cheesy mantras in the mirror and working to quiet that inner critic and retrain their self-destructive behavior is the one who is going to be healthier and happier. Not only will that person be happier, but they will also have started the journey toward greater confidence and overall social fitness. You’re not going to get there in one day—but with diligence and a little bit of faith in the system, you will see major changes in your life. This is what I want for you! Please join our community and be a part of the conversation by sharing your comments and questions below! What is the flaw you can’t seem to let go of? How critical would you be of this flaw in a friend? How can you work to start treating yourself with more kindness and respect? We’re all working on these things (yes, even me! ), so always remember that you have the support you need to start taking giant leaps forward in your self-confidence right here!